There's nothing like a blizzard and a clairvoyant to prompt someone to share their feelings. 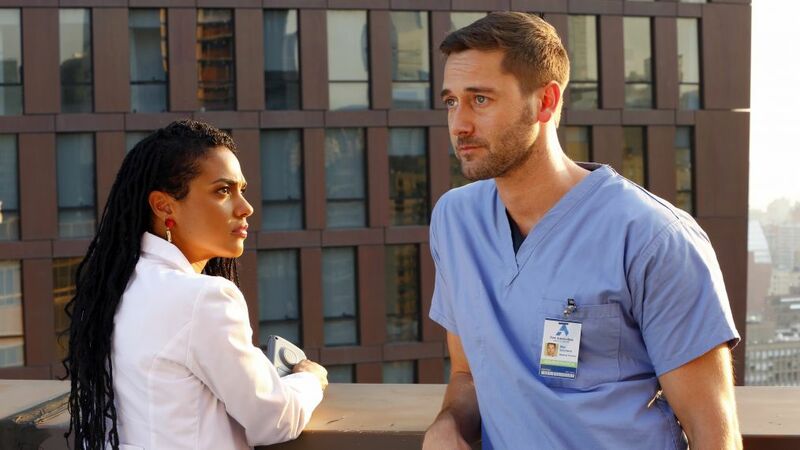 It's just too bad that in Helen Sharpe's (Freema Agyeman) case, a blackout keeps her and Max Goodwin (Ryan Eggold) from having that very important talk until the end of Tuesday's episode of New Amsterdam. In Episode 16, Max and Helen ventured out into the blizzard to treat those who couldn't make it to the hospital. Max promised her he'd take care of himself because "I love my doctor." However, the woman they treated claimed to be a clairvoyant and told Helen it would never work out between her and Max. The actor is ready to revisit his character, Tom Keen, who was killed off in Season 5. With the power out in the hospital in Episode 17, Max and Helen have to focus on their patients. Throughout "Sanctuary," she watches him refuse to rest when he should or lose even one patient, even when he has no other choice. "Your job is no longer to save everyone," she tells him. "It's to try and minimize the damage." He refuses to make that decision, and before she does it for him, the power comes back on. After the crisis is over, Max tells Helen he wouldn't have gotten through it without her, but while she didn't have to prioritize patients, she does decide to triage their relationship. The latest two episodes have tested Max and Helen as friends, doctor/patient, and medical director/deputy. "This thing where I'm your deputy and your doctor and your confidante and your friend ... it's not working," she tells him. While she's not criticizing his refusal to choose who to save, just because it worked out this time doesn't mean it always will. "Sometimes you have to choose, and you couldn't," she says. But what does that have to do with Max and Helen? "It's what you do with your cancer as well," she explains. "You want to stay healthy for your family, but you want to stay in charge of the hospital. You want the chemo, the strongest that we have, just not any of the side effects that come with it. From the day this began, from the day we met, you have refused to choose." The problem is that Max wants "everything," which leads to him making "inspiring, completely impossible demands" of Helen. When he does, she doesn't know who she's supposed to be. "I have tried to be all of the above," like he is, she says. "I can't. I can't be your friend and your doctor and your deputy, so I have to choose. I have to triage us." That means he's getting a new oncologist, and even if he wants her, "that's no longer an option." Fans aren't ready to give up on a romantic future for Max and Helen, despite her taking a step back. However, they are also proud of Helen for standing up for herself. "They seem to have developed a unique friendship," Eggold previously told TV Insider about the relationship between Max and Helen. "Perhaps because Max shared his secret with her, she's felt safe to share her secrets, and a kind of intimacy was born from that." Max and Helen's relationship will be different moving forward. Tell us how you feel about Helen's decision in the comments below.